I had never got to hold Optimus Prime until now! When I was a kid, I wanted to own him so much but I couldn't afford it. Later, there was a re-issued, but I missed it....the price for him was like $CCL for one site. 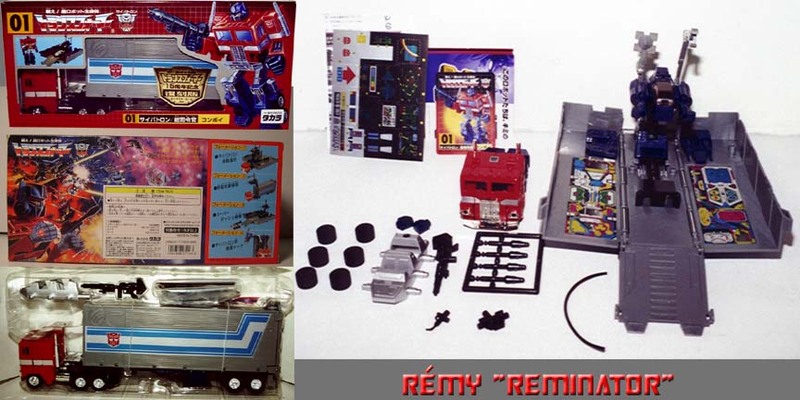 Anyhow, after many days of searching, I finally found one guy at the Ebay auction in which he sold the mint in sealed box Re-issued Optimus Prime for $CLXXII.L on Aug. Vii, Mmi. The price is mad, but I figured it's now or I'll never hold him ever. These images were all photographed and scanned by me. 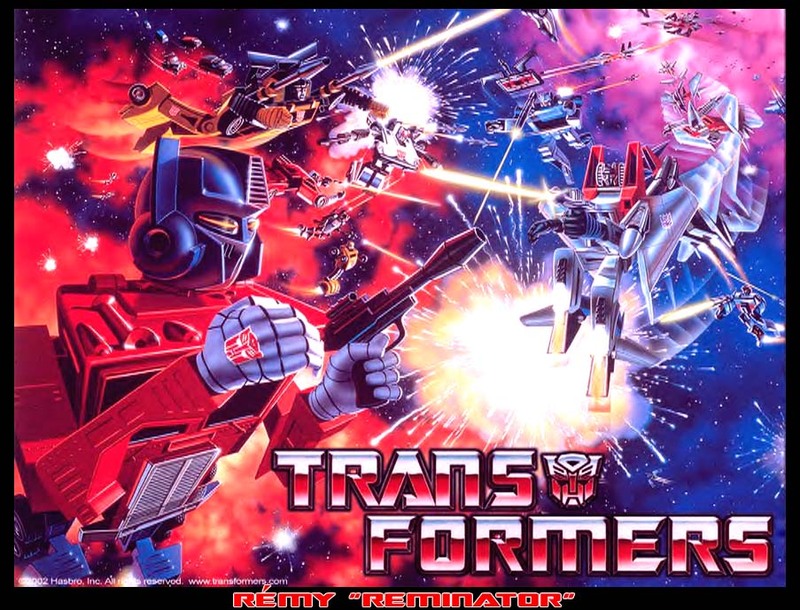 If you're a Transformers fan, this will definitely bring back some reminiscences. NOTE: Images are clearer when viewed with Internet Explorer browser. 1 - Optimus Prime in its original box, this is the Japanese version which is the same as the American version. The only different is the box and instruction which is written in Japanese. 3 - Here's how the contents look once the box was removed revealing the contents sandwiched between two clear plastic tray. And on a separate taped back, that's where you'll find all the paper works. 4 - These are all the contents that were included in the box/ package/ card: "1" cab, "1" trailer (inside is a double canon machine), "2" hands, "1" gun, "6" wheels for Roller, "1" Roller's body, "1" cable hose, "1" cable hose handler, "1" cable hose end, "1"gun, "4" missiles, "1" trading card, "1" sticker sheet, "1" instruction sheet, "1" Car Robot 2000 (RID) catalog, and 2" miscellaneous text sheet. 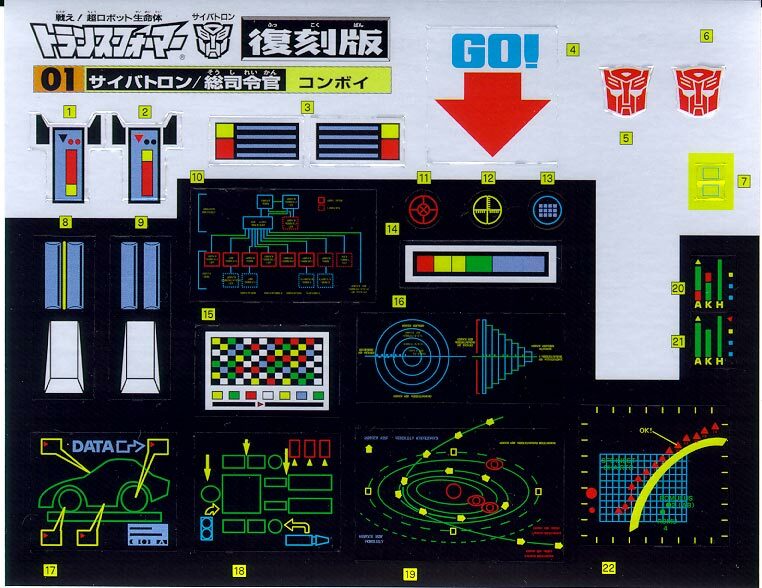 There are 13 Pre-Applied sticker that had been applied onto Optimus Prime. The first eight, (4 on each side) are located on either side of the cab. It's that silver sticker that run from the side of the cab to a little bit on the front. The ninth and tenth stickers are located outside and on either side of the trailer. It's that huge horizontal blue and white bar with Autobot insignia sticker. The huge eleventh and twelve sticker locate inside the trailer itself. The last pre-applied sticker is the Autobot Rub Sign logo located on top of the cab roof. There are 22 registered numbering of stickers on the sticker sheet. But in reality it's actually 24 stickers since some of the repeat stickers are labeled as one instead of two. These registering numbering do not include the Pre-applied stickers. Optimus Prime is a Freightliner COE dual-axle truck. The cab is capable of separating from the trailer since the connection is just basically peg and hole. On the rear of the cab, you'll notice a blue peg sticking out. This little peg is where the trailer connected onto. 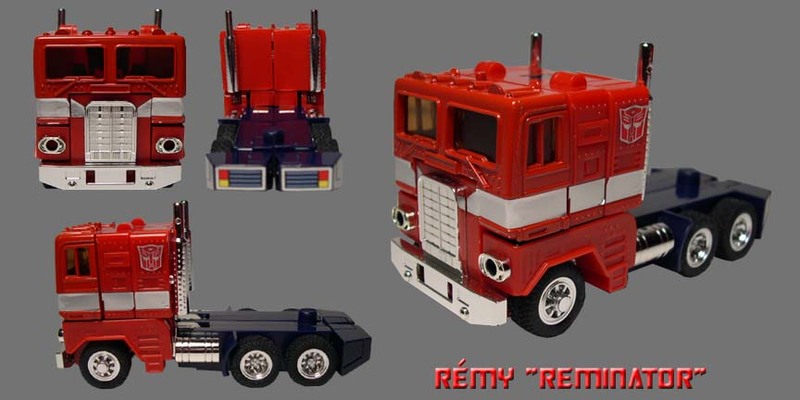 In this mode, Prime little hands can be stored inside his driver seat by simply open his whole window frame or upper chest out. 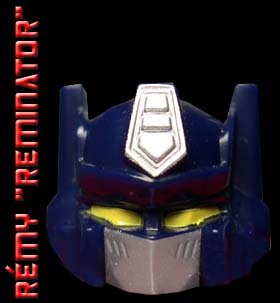 There are a couple of episodes in the cartoon where Prime was shown without his trailer so this image is not a new concept. 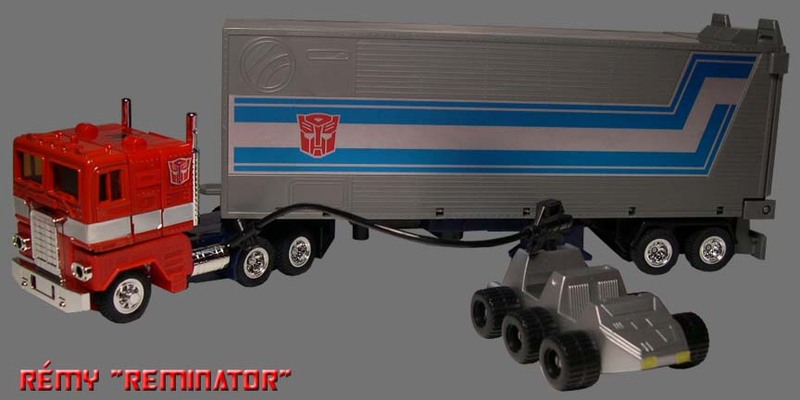 Prime looks awesome when the trailer is added onto his cab because that is how we recognized him. In this mode, Prime can store all of his accessories including both gun and his little bugger, Roller (see R-6 for more). 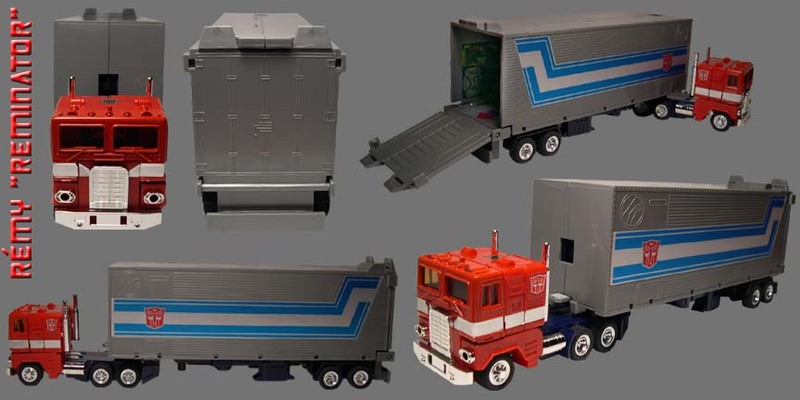 Prime trailer has a door in the back that can be swung down and serves as a ramp so cars can ramp up or down just like the real thing. Unfortunately, since the trailer is occupied by Roller and some sort of satellite combat machine, you can't really store any other Autobots car. In vehicle mode, Prime does have the ability for firepower. Unfortunately this battled mode vehicle mode was never shown in the cartoon series or in the old Marvel comic. This little machine is equipped with 2 missiles which can be fired out, a satellite hand on one side, a clipping hand on the other side, and a control cockpit with open door. For those that wonder why this yellow door cockpit is operate able, that's because in the Diaclone Line, Transformers are just machine with no personality instead it is operated by human. This little machine is very articulated, it can be rotated, move up or down, and its arm be fold in or out. Optimus Prime consists of three components: trailer, Roller, and Prime robot itself. If anyone of these components get hit, the other two can be felt as well. Out of the 98 original Transformers episode, there were only two episodes where the Trailer Combat Deck was used in the cartoon. In this mode, Roller can be fired out by simply push the button on the front of the trailer. For those that bought the U.S.A. version, this feature had been disabled so Roller will not be fired out. 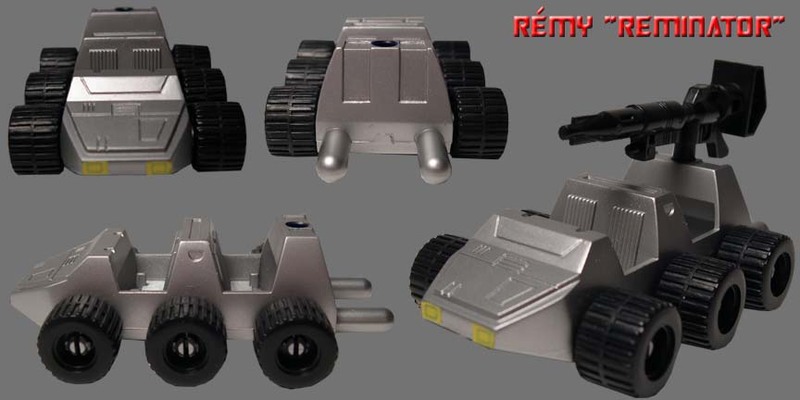 As mentioned in R-5, the little machine with satellite and missile can also be used in this mode again. Roller is a 6 wheels little car that has the capability to carry 4 humans, two in the front and two in the back. Moreover, he is actually extremely light in term of weight. Roller does not transform since he is basically a drone car that is remotely control by Optimus Prime. For a little guy and very simple figure, Roller is actually cool since you can put Prime gun on top of him to give add some firepower. In addition, Roller can act as an Oil Filler Bot too, see right image. I thought that looks cool. Of the three components, Optimus is the most important all. The other two components cannot exist without him but he can. Well here is Prime in his robot mode and other than the hip wheels, he looks very much like the cartoon. The transformation sequence is extremely easy and true the the cartoon as well, shoulder and leg both bent back. Over all, Prime is one of the very few figures of the G1 line to look great in both robot and vehicle mode. Moreover, he also got a decent articulation for the figure of his era. The trailer not only function as a trailer (R-2), or convert into a combat deck (R-6), but can also become a repair bay. Unfortunately, this feature was never shown in the cartoon series. 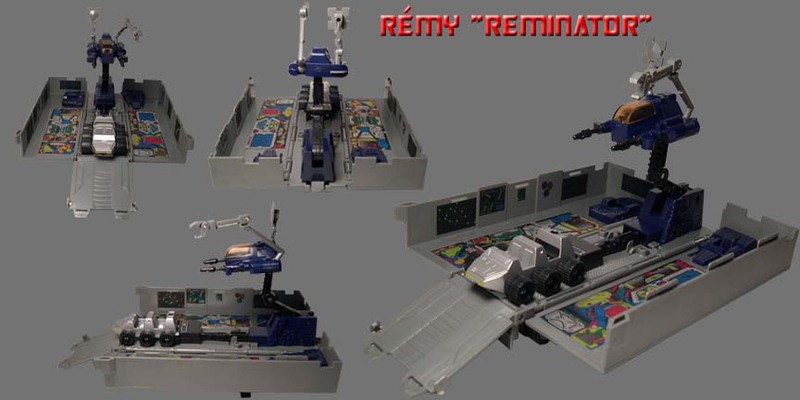 So basically, you put Prime or any Autobot inside the repair bay and the little machine (R-5) will serves as a repairer. Line, Series/ Wave: Generation 1 Line, Reissue Series. Year Issue: [2000 Reissue] - The original toy was released in 1984. Made: [China] - Although the original toy was made in Japan, the qualities and materials are pretty much the same as the reissue. Box or Card Dimension In Inches: [LxWxD] - Forgot to measure - Box. Taped down and sandwiched between two clear plastic trays are: "1" cab, "1" trailer, "1" roller body part, and "1" gun. Wires were also used to tie down the Cab and Trailer onto the Cardboard. Also inside that clear plastic tray but taped down inside a bag are: "4" black missiles (on tree), " 2" small fists, " 6" Roller wheels, " 1" cable hose, " 1" cable hose handle, " 1" cable hose end. On the back of the card board and not inside the clear plastic tray, a taped down bag which contained: "1" Prime trading card, "1" sticker sheet, "1" instruction sheet, "1" Car Robot 2000 (RID) catalog, and "2" miscellaneous text sheets.. Box Special Note: Front Box Appearance: Prime art. Back Box Appearance: The back of the box shows the 1984 Battle Scene box art. Approximately Dimension In Inches: Height Up To The Head: 6 3/16 Maximum Height: 6 3/16 Width from shoulder to shoulder: 3 5/16 Maximum Width: 3 3/4 (from smoke pipe to smoke pipe) Dept: 1 14/16. Figure's Stamp/ Fine Print: ©1992 HASBRO INC., ALL RIGHT RESERVED, MADE IN CHINA. Figure's Stamp/ Fine Print Location: Can be found underside of Prime trailer. Transformation Of Difficulty: [Easy] - Very easy to transform. Material Durability: [-A] - Pretty durable. Materials: Die Cast Metal: torso, leg and feet of the cab. Chrome Part: gas tank, engine plate, and smoke pipe of the cab. Rubber: wheels. Plastic: main material. Clear Plastic Window: front and side of the cab. Stability: [A] - Very Stable...no fear...can stand on any flat surface. Fun Figure: [A] - Definitely a fun toy due to many functions, challenging, and a cool design. Negative Drawback: Technically Prime doesn't have any negative drawback. Articulations: Head: cannot be rotated. Shoulder: can be swung at a 360 degree. Arm/ Elbow: can be bent at a 90 degree angle. The lower portion of the arm can also be rotate at a 360 degree. Wrist/ Hand: can be rotated at a 360 degree sideway, pull hand off to hide hands. Hip/ Waist: Can be bent backward at a 90 degree but no sideway movement. Leg: Cannot be bent Knee: Cannot be bent. Ankle/ Feet: No sideway movement. Feet can only be bent downward. Rub Sign Logo: [Yes] - The autobot's rub sign located on top of the cab, earlier version does not have the rub sign. Robot's Cartoon looks alike: [A] - Definitely beautiful and articulate. Vehicle's Cartoon looks alike: [A] - Utterly the bomb!!! Very Hot. 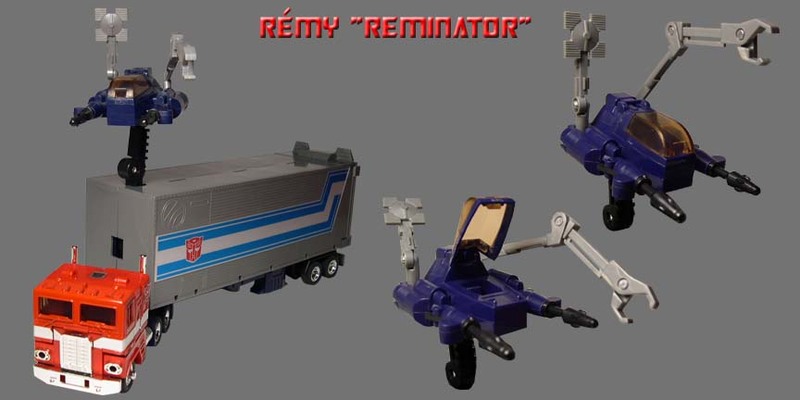 1 - Prime's trailer equips with a mechanism that can shoot out Roller (the blue/silver car). The switch is in the front of the trailer below the artillery Robot. Check to make sure that yours is workable. 2 - Prime's artillery Robot (the spaceship guns & satellite looks a like) is equipped with spring so missiles can be fired out. Check to make sure that yours is workable. Overall Grade: [+A] - Because I'm a huge fan of Optimus Prime.